9ct white gold vintage style ring featuring a large aquamarine stone at its centre, four claw setting, diamond and milgrain set shoulders and pretty curved edged detail. 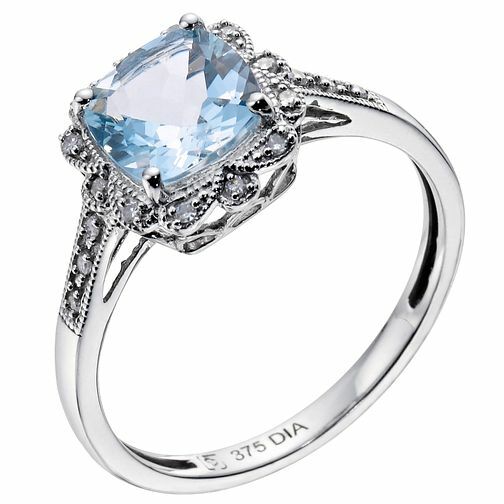 9ct white gold vintage style diamond & aquamarine ring is rated 4.6 out of 5 by 20. Rated 5 out of 5 by Anonymous from Beautiful Little smaller than shown on figures but beautiful all the same. Rated 5 out of 5 by Anonymous from Stunning ring I received this as my engagement ring Oct 2013 its still as beautiful today as it was when I received it. Everyone comments on it and admires it especially when I've had it cleaned. In certain lights you can see a heart in the centre of it. Perfect size and really lovely to wear.